The Pestana Gardens Aparthotel is on Formosa Beach Bay and has great views of the bay and Cape Girao, the second highest promontory in the world. 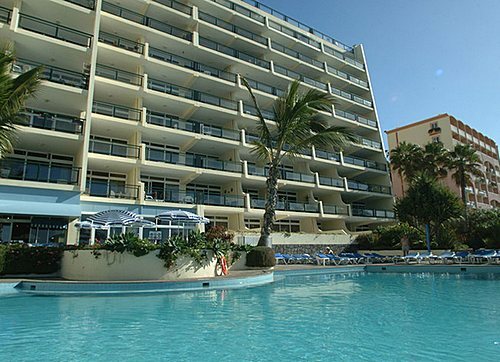 The aparthotel operates a free shuttle the 3 miles into the centre of Funchal. Funchal is a good mix of old and new with 16th century architecture sitting alongside the more modern developments. The marina and Lido are popular areas, as are the many gardens and markets. There are a wide variety of shops and boutiques and the restaurants have a good selection of Portuguese cuisine and Madeiran wine. This aparthotel in Madeira will appeal to couples and families looking for a smaller property in a quiet beachfront location with the added flexibility of dining out or eating in. The aparthotel has a freshwater swimming pool with children`s area.The property has a restaurant with an a la carte menu and a bar.